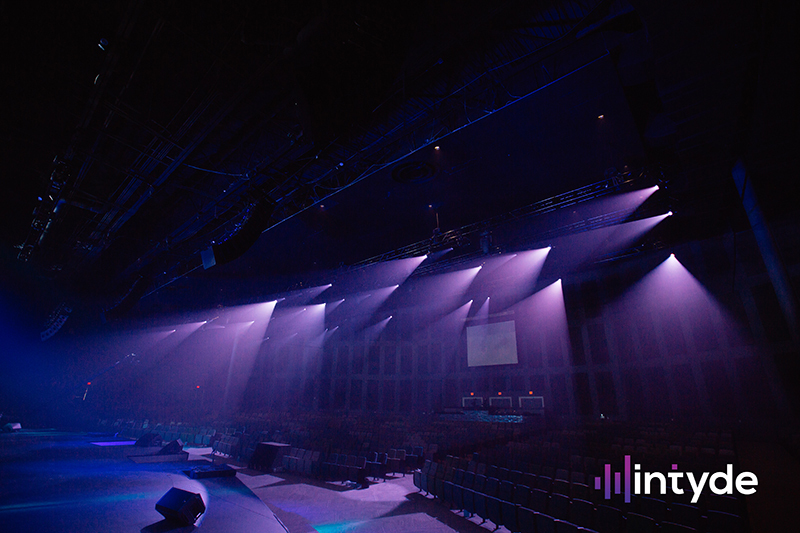 Redemption to the Nations church in Chattanooga, TN, located on the site of the former Highland Park Baptist Church and Tennessee Temple University in Chattanooga, TN, recently renovated their 2,000-seat sanctuary and outfitted the space with a new Elation intelligent lighting system spec’d and installed by intyde. Platinum Seven wash fixtures are mounted over the center video wall. The leadership of this fast-growing congregation acquired the 55-acre Highland Park/TTU site in 2014, seeking to gather the entire ministry onto one campus. As many of the campus buildings were outdated with antiquated lighting and audio systems, Redemption to the Nations began to renovate a number of buildings, including the 2,000-capacity worship auditorium. 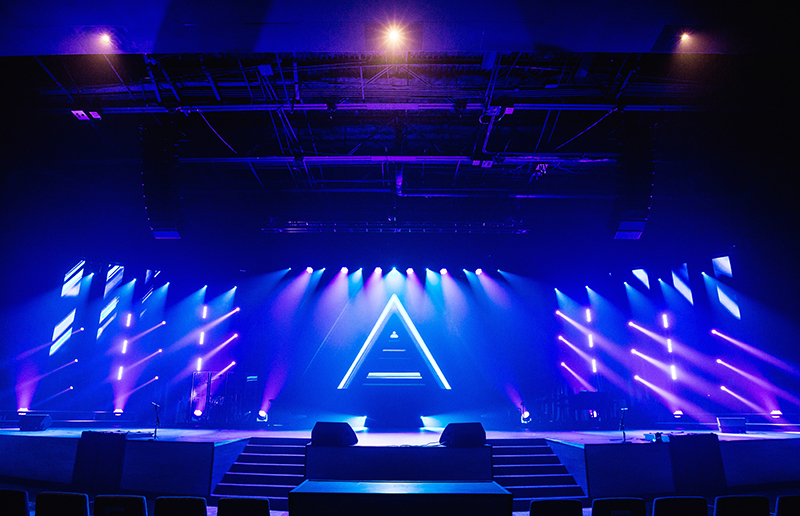 intyde, a Franklin, TN-based creative systems integration company that specializes in designing scalable audio, video and lighting systems, is Redemption to the Nations’ vendor of choice for many of the campus renovations and was tasked with completing the in-house design build for the sanctuary, a project that included new lighting, video and audio systems for the large space. Elation ACL 360i fixtures fill the space between the video panels. The new LED lighting system was installed relatively quickly, from start to finish, in less than two week – from Oct. 9 to Oct. 21, 2017. The impressive new system includes a variety of Elation LED moving heads — Satura Profile, Platinum Seven, Platinum Spot III and ACL 360i fixtures — along with Colour 5 Profile ellipsoidals and SixBar 500 battens. Platinum Spot III fixtures provide the hard edge beam. 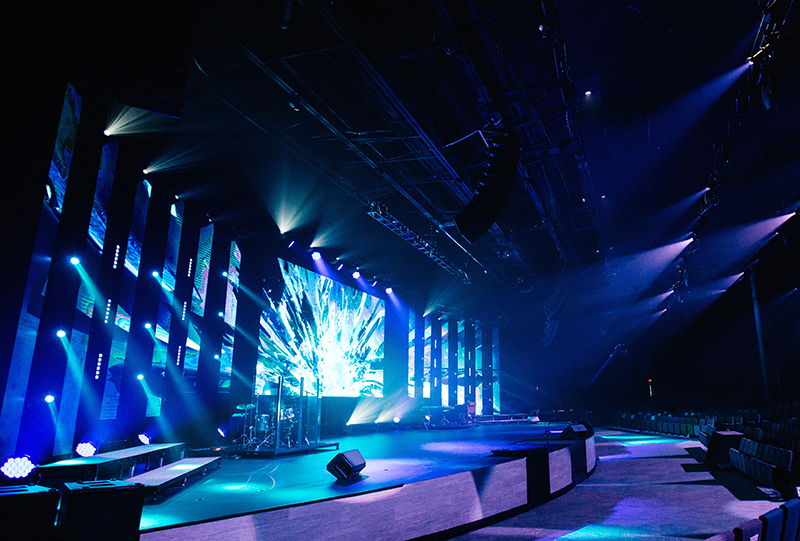 At 124 feet deep and extremely wide at 253 feet, the worship auditorium required an even front wash of light across a roomy stage. The previous system, which relied on 50 feet of a single truss layer in an attempt at a 120-foot-wide wash, was deemed inadequate for the vast space, Tomberlin says. The design merges church lighting with theatrical lighting. Each fixture group, when used alone, demonstrates a unique but complete look in the design while allowing ample room for creativity. 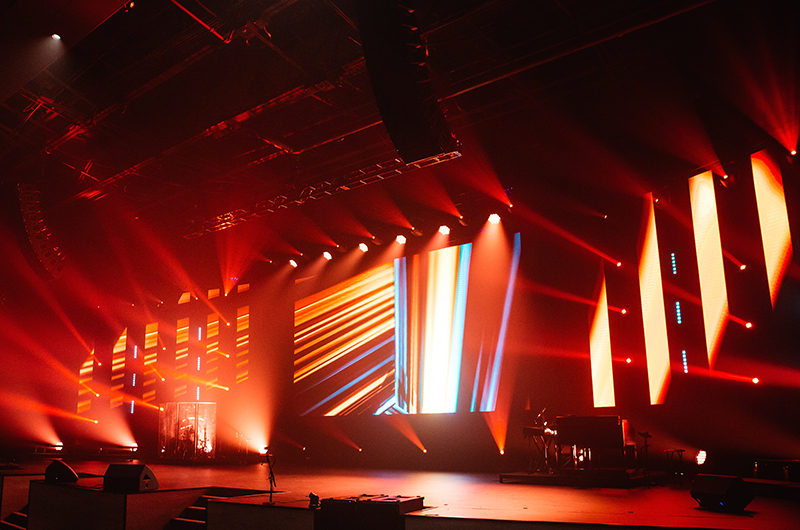 Powerful ACL 360i single-beam moving effects are used to complement the vertical LED display columns by creating stacked beams with a full range of motion. intyde added the SixBar 500s and its individual LED control to supplement the LED wall for a minimal static color look. Lumen output of all the LED luminaires had to be sufficient enough to power through the 1200nit LED wall, and because much of the lighting is on motors, full design changes and reconfiguration of the LED wall and lighting are uncomplicated. To underline the system’s adaptability, Tomberlin says that any of the lighting equipment can be motored down and moved elsewhere on campus if required.